Why can my eye focus on the real image of a convex lens at many distances from the lens, but a projection only works at a specific distance? Where f is the focal length, s1 is the distance from lens centre to the projection plane, and s2 is the distance from lens centre to an object. Now say I remove the projection plane and replace it with my own eyeball. I can see (part of?) the real image through the lens. 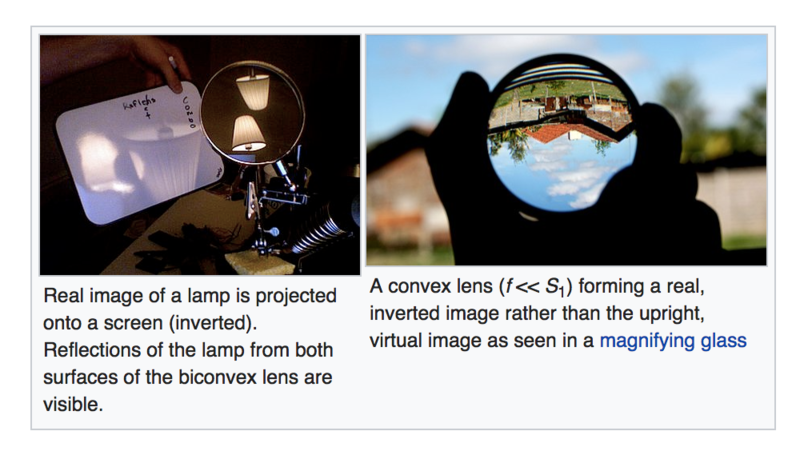 I know its not the virtual image because the image is upside down (whereas the virtual image created by a convex lens is the right way around). Now I take a step backwards from the projection plane, and the real image as seen through the lens is still in focus to my eyeball. I take a few more steps backwards and the image is still in focus. Why can my eye see a focused image at many different s1 values, but a projection can only be focused at a specific s1? You don't really see a real image. You always see a virtual image, just an upside-down one. When you say you see a real image, this just means that there is a focusing plane where you could place a translucent screen and still get an image. Now your premise is that you can place your "eyeball" in the focusing plane and see an image. That's actually exactly when you can't see an image since you cannot focus on your eyeball (and a good thing you can't). The lens in your eyeball allows you to focus on virtual images before your eye by creating a real image on your retina from them. But you cannot look at real images that would appear on your eyeball itself. In fact, when the real image passes your eyeball and consequently the virtual image flips upside down you only see an indiscriminate blur (the image of a single point that cannot decide whether it's upside down or not). Any image is where all the light appears to be coming from. When you capture a real image on a screen or paper, you collect all the rays of light arriving there and redistribute them in all directions again. That means that you are dependent on all rays coming from the same light source or you'll be mixing things up. If you remove the screen, light rays will leave in the same direction they have been arriving and will not mix. Wherever your eye views the scene, the light from some object's point will pass through the corresponding point of the real image, allowing you to focus on it. The difference between a real and a virtual image is basically that the point where your "viewing lines" to a point of a visualised object converge are in front of the lens rather than behind it, meaning you can place a physical screen there and capture and redistribute light at that plane's point without mixing light from different points of the object. Not the answer you're looking for? Browse other questions tagged focus focal-length optics camera-basics or ask your own question. A projection of a real-image is one fixed perspective, but looking through the lens with my eye, I see many perspectives. Why? Why is the focus distance for a mirror image further than the surface of the mirror itself? At what distance from the lens will the image be in focus given a subject distance and focal length? Is there an “optimal” background distance when striving for a minimally distracting background? Why isn't my computation of the actual size of an object in a photograph matching the expected value? Where is the image sensor located in a camera with a fixed-focus lens? How does the focal length help in capturing wider or narrower picture?